This record is not about the record cover. Although it has a Robert Crumb knock-off art the cover is not what’s interesting about it. I picked it up last summer at a swap meet. Some nerdy guy was selling a small box of about 10 of them. CD’s nowadays have all kinds of parental scare labels on them. This one is better than that. 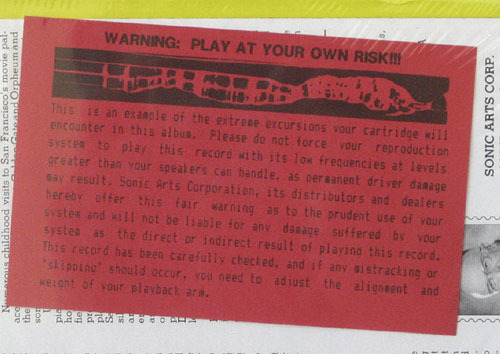 It has a simple red photocopied insert that says “WARNING: PLAY AT YOUR ON RISK!! !” and they mean it. They go on to issue a “fair warning” that playing this record may damage your stereo system. WTF! What kind of mind bending record is this that can send my stereo to a landfill? It turns out this is a SAC-PCM DIGITAL RECORD. You know how CDs work? The zeros and ones? This is like a CD but cut in vinyl. You need some sort of digital to analog decoder to play it back. If you don’t have one it’s almost certain the solenoids in your speakers will fry like a cheap sausage. The problem is that nowhere on the back of the record do they explain what kind of equipment you need for proper reproduction or where to obtain it. 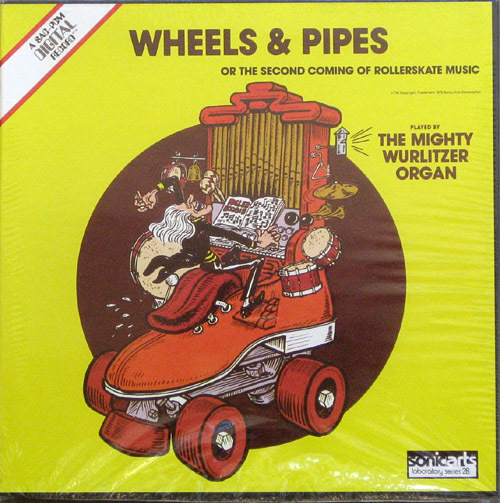 The “Wheels & Pipes or the Second Coming of Rollerskate Music” was performed by Warren Lubich on the mighty Wurlitzer organ at the Redwood City, California Pizza and Pipes Place. It is number 28 in the “Laboratory Series.” The record was released by Sonic Arts Corporation of San Francisco, California with Leo de Gar Kulka, the President. It is dated 1981. There is very little information on Sonic Arts Corporation available. The only mentions of Sonic Arts Corporation I found are in resumes of people who worked for the company in the 1970s. In spite of its technological sophistication it appears that the heyday of Sonic Arts Corporation was during the years when the Internet was being developed as secret weapon in the fight against the Soviets. Some of the technical detail from the back cover reads like a psy-ops warfare material. Mr. Gar Kulka claim that certain sounds on this record are reproduced at 16Hz while several dip even lower into the subperceptive 5Hz. Conspiracy theorists have claimed for years that the U.S. government has experimented with low frequency sound weapons that can cause disorientation and severe discomfort. Well, why wait for the government to do it. With this record you can do it yourself. 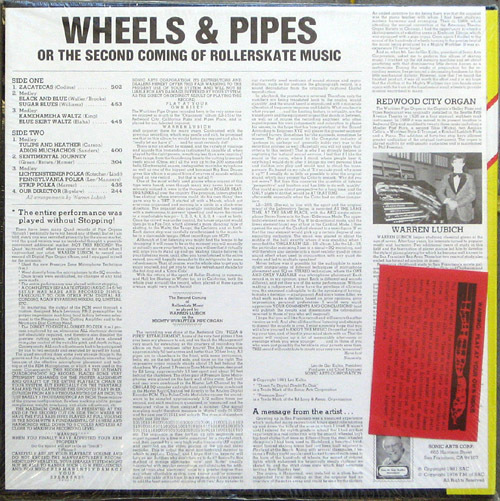 This entry was posted in Records and tagged Gar Kulka, Laboratory Series 28, Organ, PCM, pipes, Roller Skate Music, Sonic Arts, Warren Lubich, Wurlitzer. Bookmark the permalink. 5 Responses to "Digital Vinyl—A Sonic Weapon"
Wo die Suchmaschine mich den ganzen Tag hinfuehrt 🙂 Tolle Page, ich werde nochmals kommen. I was just out in San Fran and picked up an LP at the Haight Goodwill. matrix #LS-47 B R 17 76.41065.
somebody went over that letter and attempted to correct it. Also witten on the label is “TEST PRESSING”. One side of the record has grooves, looks like maybe three to four songs. The other side has no grooves, totally blank with a totally blank label. I don’t know brother. But what I found out is that the record I have can’t be digital because at 33 RPM there is not enough bandwidth for a decent digital recording. The record would have to spin much faster even to get 8-bit audio. One of these days I am going to play this record even if it destroys my cartridge. I thought your comments were somewhat naive, unless you have a uniique sense of humor. Leo de gar Kulka was not only an incredible engineer in his day, but also was the founder of the Northern California Chapter of the Audio Engineering Society. There is now more information on the great man on the web, particularly put up by his nephew, David. The lp you found was an early attempt to cut vinyl using PCM encoded source masters as source material. Leo was also a noted mastering engineer and typically not only engineered these sessions, but also usually cut the lacquers from the masters himself. You might see his initials right in the “dead wax” band, just before the label. In any event, Sonic Arts was part of his operation for years, a specialty label devoted to ultra fidelity discs. I have seen crates of these things showing up at one Oakland, CA flea market (about two years ago), because someone ran into a storage auction containing them. The other thing I wanted to suggest to you is to do some research outside of web searching. Sonic Arts Laboratiories lps were reviewed in the audiophile press and reviews were published in the pages of such magazines as The Absolute Sound, probably Stereophile, Audio and maybe High Fidelity. These lps were regarded as a premium product and some were produced in the trendy, but VERY limited edition format of “direct-to-disc”, which Leo decided to call “Direkt-to-Disk” or the like. The warning on the lps that they could theoretically damage your audio system was aimed at folks who tended to blast sound over their loudspeakers, driven by enormous behemouth power amplifiers in the undred of watts per channel range. The discs themselves were pressed on virgin vinyl, often by Teldec and they were usually dead quiet pressings. You could sometimes damage a tweeter or tear a woofer assembly if you cranked these things up too far, not to mention damaging the output stages of an amplifier, methinks. Leo de gar Kulka was truly a genius engineer and also taught many young people the art of recording at his local “College of Recording” formerly located on Harrison Street in San Francisco. Leo also ran Golden State Recorders, a fine studio. Many of the early SF rock and roll bands recorded in his studio A.
Leo also recorded the original 50’s hit “Alley Oop” by the Hollywood Argyles. Richard is right about the extended frequency range of these records at high volumes. I graduated from The College for Recording Arts and worked with Leo as an assistant recording and mastering engineer in the early ’80s at Sonic Arts. Leo was one of the absolutely best mastering engineers in his day and a wonderful, kind person to be around. For Max, as I recall, the letters and numbers on the transcription disk were the serial numbers of the project that Leo used to hand-scribe into the disk. The “Test Pressing” means that Leo cut a transcription disk that would be shipped to Teldec in Germany to have a small number of “plastic waffles” made to see how they would sound if they went into full production. As a mastering assistant, I used to carefully pack and take these transcription disks to the post office and mail them to Germany. After Leo decided he liked the test pressing, he would cut another transcription disk for production and often personally sign his name in the land on the inside of the disk by the label. If you want more information about Leo and that San Francisco music era you should try to contact Ken Lee of Ken Lee Productions. Ken is another great mastering engineer and a protege’ of Leo’s.